Mekong Slow Boat Travel to Laos – travelographie. 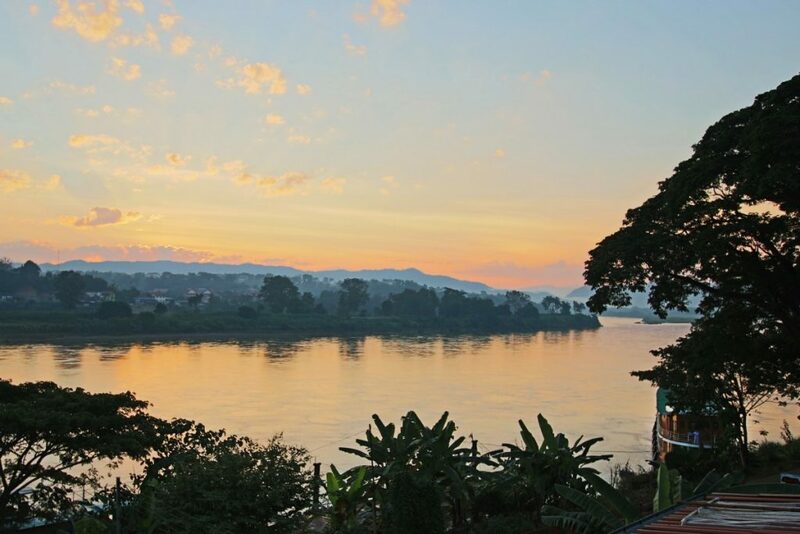 Laos is the kind of place where the journey matters as much as the destination. In a country where many places are still only accessible by foot or by boat, it seemed like we would miss out on so much if we flew straight in. So, we decided to travel to Laos via the Mekong River, the only major highway to speak of in Laos. The Mekong River is the lifeblood of the nation, where long wooden “slow boats” facilitate trade, transportation, and cultural exchange with neighboring China, Thailand, and Cambodia. 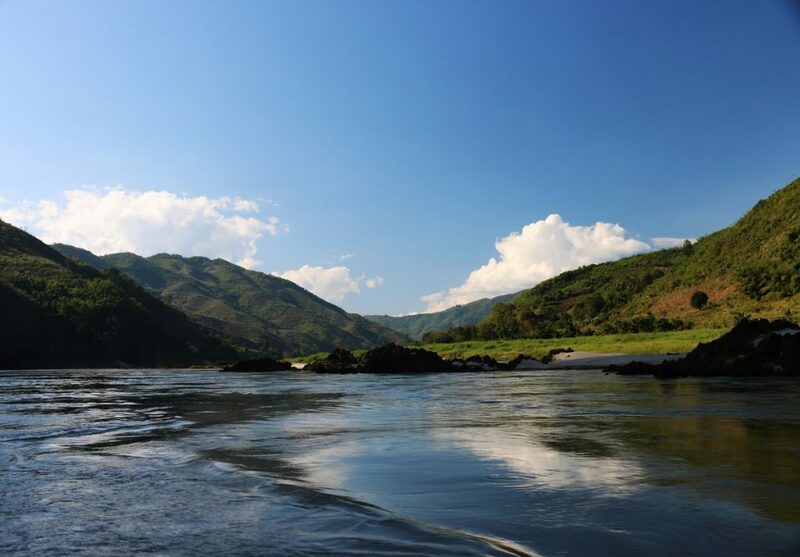 In the Lao language, Me Khoong means “Mother River,” underscoring the centrality of this waterway in Laotian life. The Mekong weaves through impenetrable jungle mountainsides in the north of Laos and flows placidly past the plains and plateaus of the south before rushing over incredible stony waterfalls near the 4000 Islands on the border to Cambodia. 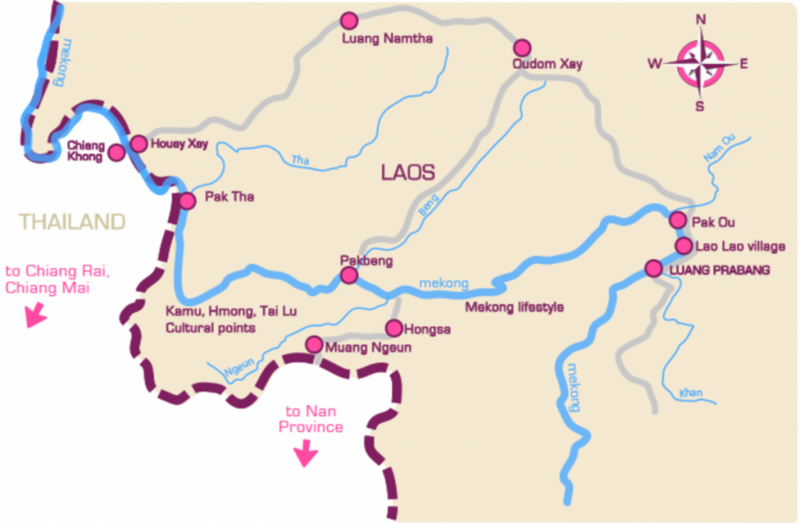 The most popular Mekong River slow boat route is from the Thai-Lao border crossing at Chiang Khong, Thailand and Huay Xai, Laos, to Luang Prabang in north-central Laos, and vice versa. From the deck of a Mekong slow boat in Laos, it’s easy to see why Laos is so often described as forgotten, timeless, and peaceful. 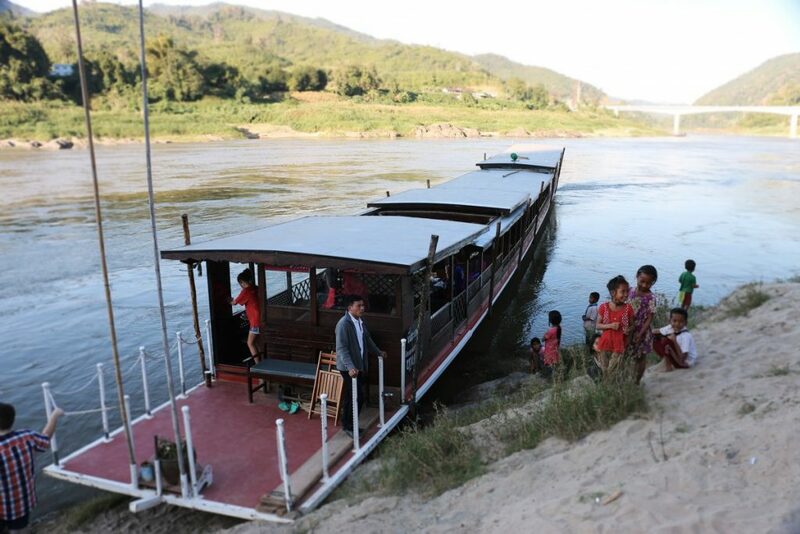 There are several slow boat operators that ferry passengers between the Thai-Lao border crossing at Huay Xai and the city of Luang Prabang. Traveling to Luang Prabang takes two days, with a stop in Pakbeng overnight. There are two options to travel to Laos from Thailand: local slow boats and tourist-oriented premium Mekong slow boat cruises. A map of the Mekong slow boat cruise route, from Huay Xai to Luang Prabang or vice versa, with an overnight stop in Pakbeng (map courtesy of Shompoo Cruises). From what we heard, the local slow boats live up to their name: they are really, really slow because they make numerous stops along the river to pick up more passengers. Amenities are said to be scarce on board, and the seats uncomfortable, if you’re lucky enough to get one. The local slow boats can’t be booked in advance, and can fill up during holidays and the high season. In short, the local option is certainly the more authentic one and it comes at a fraction of the price of the tourist slow boats. But we wanted to experience the tranquility of the Mekong and were willing to pay more to have more space and amenities on board during our two-day journey from the Thai-Lao border at Chiang Khong/Huay Xai to the Laos’s Luang Prabang, a UNESCO world heritage city of temples. This turned out to be the right decision, and our Mekong slow boat cruise was the highlight of our trip to Southeast Asia. Our slow boat on the Mekong in Laos. 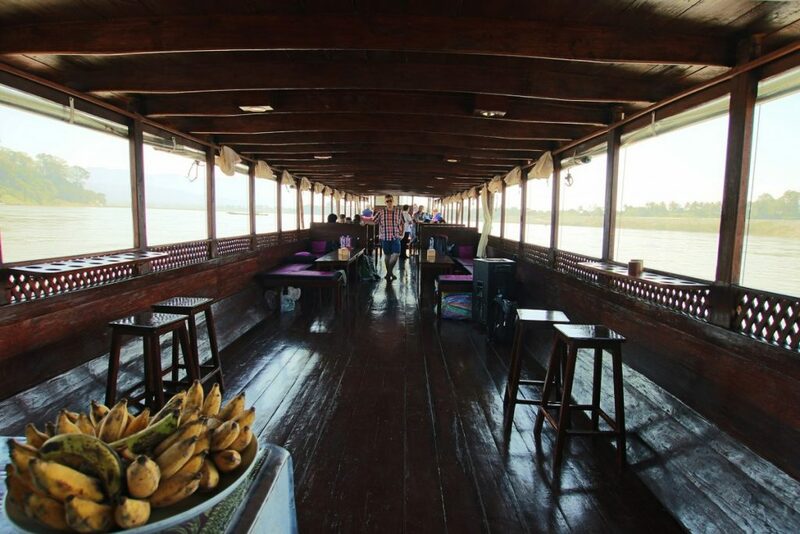 We traveled the Mekong with Shompoo Cruises on a wooden slow boat from Huay Xa to Luang Prabang, Laos. The price with Shompoo during the high season (2016-2017) was $165 per person. This seemed high to me, but it included a pick up at the Thai-Lao border crossing of Huay Xai, transportation to the slow boat dock in Huay Xai, all drinks and food on board (and the food was really good! ), enough room to sprawl out, all excursions during the trip, government taxes, an English-speaking guide, a beautiful lodge in Pakbeng with a balcony overlooking the Mekong, dinner in Pakbeng, and an impeccably clean bathroom on board. Even though I hemmed and hawed about the price before making the booking, it turned out to be a good value, especially considering that on the second day, we visited the Pak Ou caves as part of our slow boat trip. Had we not done this as part of the cruise, we would have had to do it as a half-day trip from Luang Prabang, which costs about $30 per person. Our slow boat lays anchor at a local Laotian village on the Mekong. 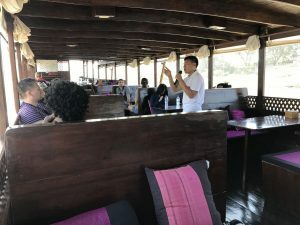 After making it over from the Thai-Lao border crossing, our guide from Shompoo Cruises picked us up and took us to the slow boat dock in Huay Xai. We got to the boat and staked out our spaces on a long bench near the middle of the boat. We were tempted to sit at the back of the boat for the views, but we decided against it since this is where the noisy diesel motor was located. Our guide telling us about the history of Laos on our slow boat trip with Shompoo Cruises. After getting underway, our guide gave us an introduction to Laos, and the history of the Mekong. We talked with him later, and he had a fascinating story. He had been born in northern Laos and always wanted to learn how to read, so he joined a monastery in Luang Prabang, where he learned English by interacting with tourists. This gave him an edge in a country where tourism is still in its infancy, but on the rise. During the cruise, we watched the river laze by. The slow boat lilted gently back and forth like a hammock. We read, we napped, and we napped some more. Lunch onboard our Mekong slow boat. On the first day, the slow boat traveled from the border at Huay Xai to Pakbeng, which is about halfway to Luang Prabang. 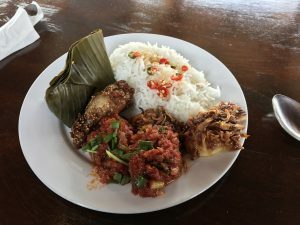 We were treated to a delicious lunch of Mekong fish patties steamed in banana leaves, chicken, and rice with a fiery tomato sauce. Along the way, we stopped at a Hmong village. Around 5pm on the first day, we arrived in Pakbeng and headed up to our hotel, the Mekong Riverside Lodge. 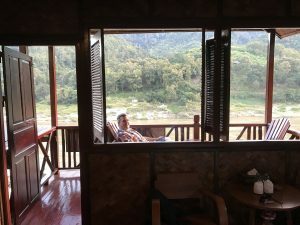 We were thrilled with the view, and spent the evening and the early morning parked on the balcony watching the Mekong river flow by. A view from our waterfront balcony at the Mekong Riverside Lodge in Pakbeng, where we spent the night on our two-day Mekong cruise. Pakbeng itself doesn’t have much to do or see. It’s a transit point for the slow boats plying the river and has a kind of border town vibe to it. But it’s fine for a one-night Mekong “layover.” We got a massage that night and had a pretty forgettable dinner at our hotel’s restaurant. Once night fell, the stars shone shockingly bright. It was so quiet and so dark that I slept more deeply than I had in years. The next morning, we got up to watch the sun rise over the Mekong. The temperatures had dropped pretty dramatically overnight and mist crept in from the mountains. We warmed up on the balcony with hot tea. At an elephant camp across the river from Pakbeng, mahouts led the elephants down to the shore for a morning bath. It’s amazing how creatures so big somehow manage to frolic in the water. Sunrise over the Mekong, where the slow boats had docked for the night. On the second day, we cruised all morning and had lunch on board. We took the time to chat with our guide, catch up on our reading, and sink deeper into relaxation. 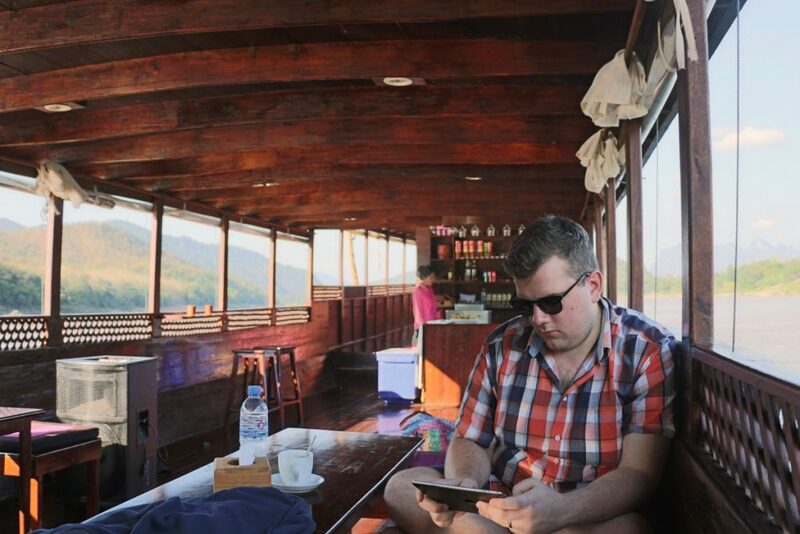 Dominik catching up on some reading and relaxation during our slow boat cruise to Luang Prabang. 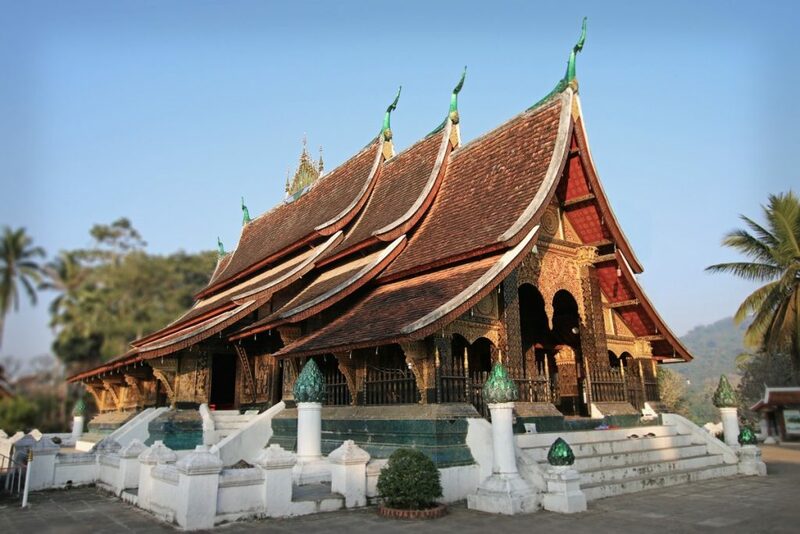 In the afternoon, we made stops for two excursions before reaching Luang Prabang. The first stop was Pak Ou caves, which are carved into a sheer mountainside. 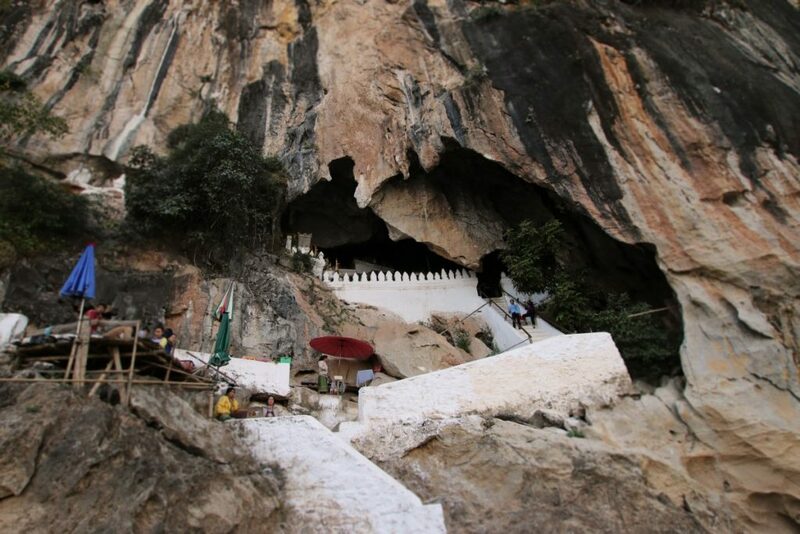 There are two caves, each of which is filled with Buddha sculptures. The lower cave is more like a mountain grotto, with just enough light to see the Buddhas smiling mysteriously back at you, but in the upper cave, we had to use our phone as a flashlight to make our way inside. Our Mekong slow boat included a stop at Pak Ou Caves, which are filled with hundreds of Buddhas. The climb to the upper cave is worth it. I couldn’t decide if the vibe was eery, or peaceful, but going into a cave and shining a light onto hundreds of Buddha statues smiling back at you through the dust and cobwebs clinging to their frozen expressions was something I’d certainly never experienced before. 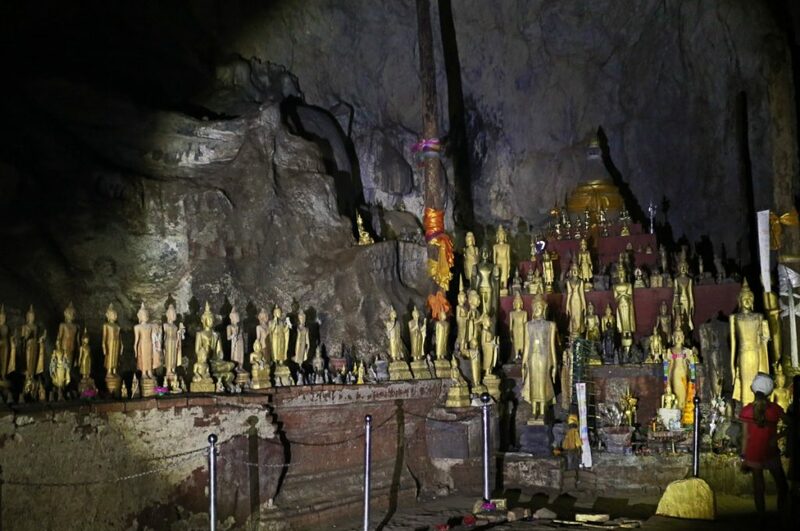 As we learned, the Pak Ou caves themselves aren’t used for worship, but as a repository for damaged or old Buddha figures that have been taken out of circulation from other temples in the region. In that sense, the Pak Ou caves are a kind of rest home for these Buddhist relics. Locals paddle in once a year from the surrounding areas and Luang Prabang to bathe the figures as part of a religious festival. The upper cave at Pak Ou, filled with hundreds of golden Buddha figures. The next stop was Lao Lao village, a kind of touristy riverside town known for its whiskey making. Some of the bottles of whiskey had snakes or scorpions in them – the uncannily preserved reptiles and insects are said to have medicinal properties, for everything from curing impotence to restoring hair loss. The women were selling beautiful scarves at fair prices (the textiles in and around Luang Prabang are the best and cheapest I’ve seen anywhere in Asia). We arrived in magical Luang Prabang around 5pm on the evening of the second day. We were sad to say goodbye to our Mekong slow boat, but excited to see what more Laos had in store. Wat Xieng Thong temple in Luang Prabang. 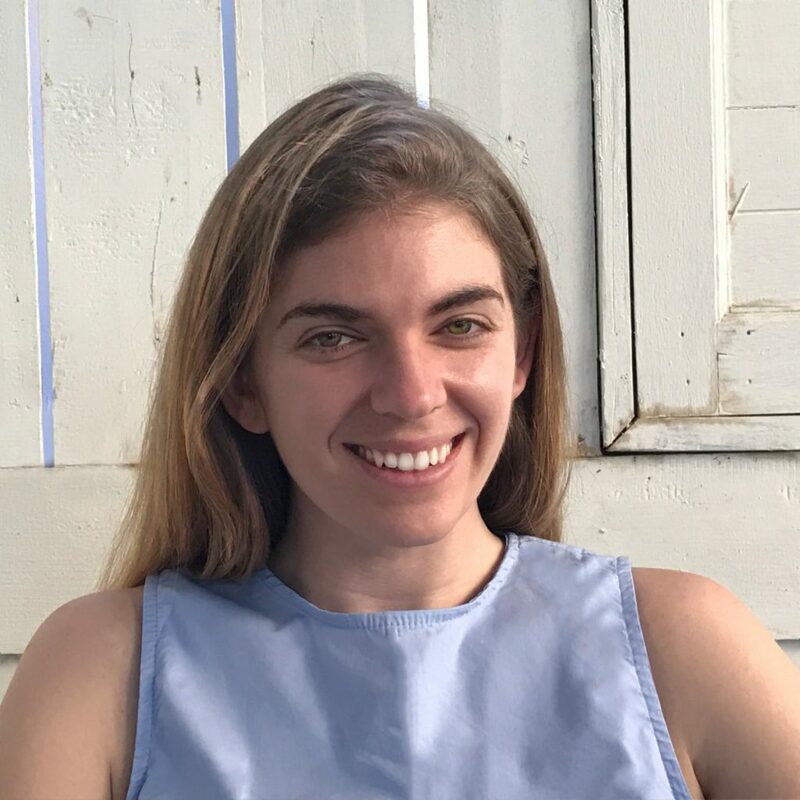 While hydroelectric dams are certainly a more sustainable source of energy than coal, the infrastructure does leave a deep ecological footprint on ecosystems and wildlife populations and alters the traditional hunting and gathering practices of local peoples. The Mekong basin is exceedingly rich in biodiversity, second only to the Amazon, and even slight changes in the flow, temperature, or sediment profile of the river can have disastrous impacts on fish and animal populations. The ecological impact is already visible, even to travelers like us passing through. During our Mekong slow boat cruise to Luang Prabang, I was struck by how quiet the river was. Unnaturally so. Nature is rarely quiet: even when it is still, there are birds chirping, the wind blowing in the trees, the hum of insects. It took me a while to place it: there were no birds. Our guide told us that the birds, even local song birds, have been hunted to near extinction by local villagers. Decreased access to fish in the Mekong, in part because of the dams but also due to upstream runoff and pollution from China, have depleted the fish stocks the locals depend on. 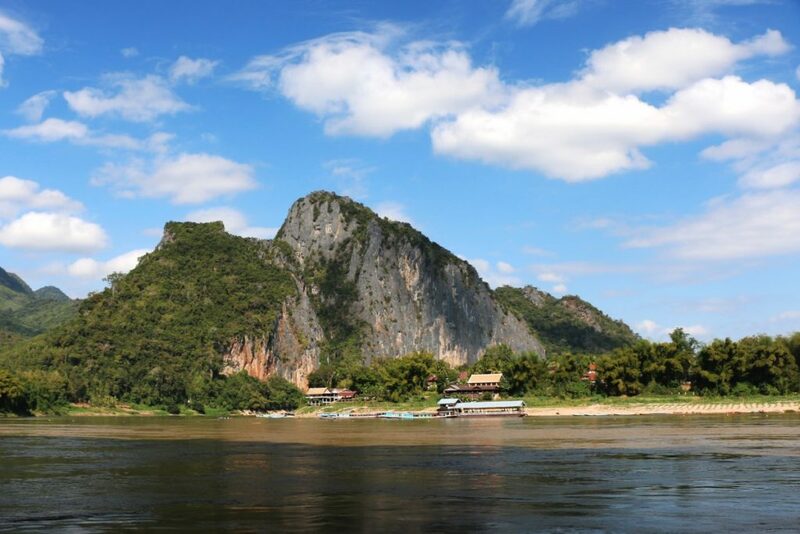 A karst mountain along the Mekong, viewed from the Pak Ou Caves. With climate changes’ rising temperatures, less predictable monsoons, and longer periods of drought, water politics in the region will likely become a more divisive issue in the future, especially given that China controls the floodgates of the Mekong: some 90 million people downstream of China in Myanmar, Thailand, Laos, Cambodia, and Vietnam depend on this watershed for their livelihood. This was an anxiety we heard from many people during our time in Laos (and, actually, everywhere in Asia). On our drive from Luang Prabang through the jagged mountains to the capital of Vientiane, we saw no fewer than five Chinese dam projects in progress. Next to the dams, little cities of trailers and temporary housing for workers had been erected. The signage was all in Chinese. Presumably the projects were staffed with Chinese guest workers rather than the local Lao workforce. Anxiety about a rising power’s strong hand in local economic and infrastructural projects is not new, of course. Empires have fought for control of the Mekong since antiquity, most recently the French colonial occupiers and the Americans during the Vietnam War. Laos suffered greatly during the American bombing of Vietnam and Laos during the Secret War. 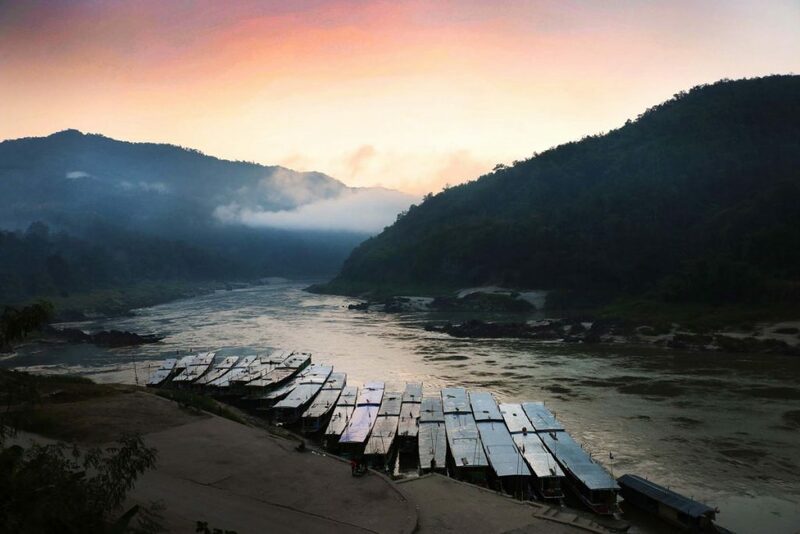 I wonder what the Mekong will look like in a few decades: will slow boats here in Laos will still move up and down the river at a tick above its natural flow, or if they will be replaced with speedboats and highways carved by foreign powers through jungle mountain passes? My husband and I would like to do the slow boat ride this winter when we are in Laos. Our plan was to wander through northern Thailand, cross the border and take the slow boat. We usually don’t book ahead and just go with the flow but I am not sure how busy it is in December. My question is how far ahead did you book to do this trip on Shompoo? Is it possible to just go and get on a boat? I know what you mean! I hemmed and hawed over whether to book in advance or book as we go – I prefer the adventure of seeing where the road takes you, but during the holiday week (December 24-January 2) things fill up fast in SE Asia. I’ve been to Thailand, Laos, Cambodia, and Vietnam over Christmas, and in all cases I was glad I booked in advance, especially in the more off-the-beaten path destinations where there’s not that much choice of accommodations (e.g. 4000 Islands in Laos, Con Dao, Vietnam). Most of the best budget accommodations/Airbnbs will probably already be booked, but I do think you’ll be able to book accommodation as you go, especially if you have a little more to spend or are looking for more upmarket hotels. It will definitely not be a problem to show up in Chiang Khong and book a ferry to Luang Prabang a day before departure. The hotels there will help you with the ferry bookings. Our cruise was blissfully empty – I think the boat was maybe a quarter full! You’re going to absolutely love this itinerary. It was one of my favorite trips, period. Thanks for reading, and let me know how your trip goes!